OK, so this recipe does tend to read like an endorsement for New Mexico chile peppers and products, (and it's one of the few recipes I depend so heavily on canned, packaged products since I can't actually GET freshly roasted green chiles easily - except when I'm lucky enough to be hanging out with my amazing friends in the Southwest) but I have to admit, canned enchilada sauce makes this recipe quick, easy, and delicious. 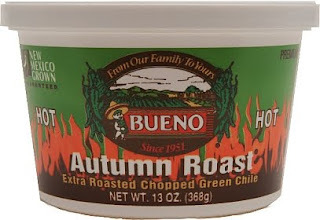 I DO know the Whole Foods stores in Seattle are starting to be all trendy and make a big deal of how they're roasting fresh Hatch chiles - if you happen to see them crank up the roaster, BUY SOME!!! 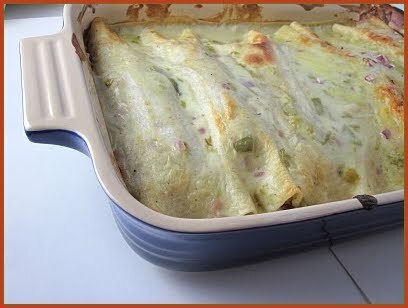 Seriously, I don't think you should use any other chiles if you want REALLY amazing enchiladas. I particularly like the creamy sauce in this recipe as it's rich enough that no fake-cheezy products are needed. those enchiladas look amazing! here, my family waits all year for the hatch chile festival. this year's festival just started, and we can't wait to get our hands on those chiles! I LOVE this recipe. I have also made it with veggie ground round. Absolutely YUM ! 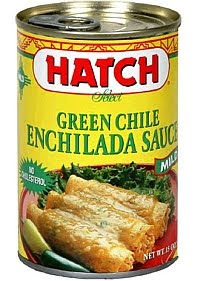 I have no access to the Hatch chiles locally so I pick up cans when I travel. Thanks for this recipe! I can't believe I get to meet you in person in just one week--yay! I spent a month in Taos during college and had green chile sauce every day. Every. Day! This sounds like a great dish when the weather starts to cool off.